Among the issues Apprising Ministries covers is the heretical Word Faith movement as it continues heading toward acceptance within the mainstream of evangelicalism; and as I mentioned previously, people Joyce Meyer and Joel Osteen with man-centered self-esteem messages ala Robert Schueller are actually tip-of-the-spear for deeper WF heresies. 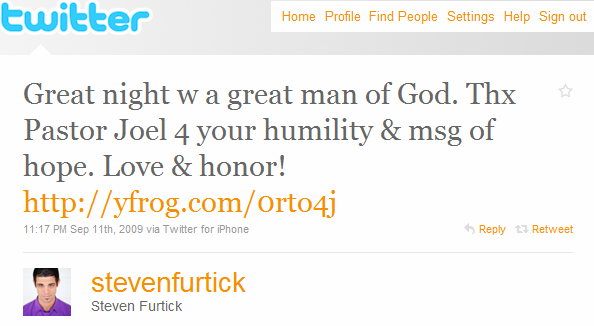 Further, Furtick’s latest project is working the Word Faith-like shtick of his forthcoming book Sun Stand Still, where in a style quite reminicent of well known Word Faith preacher Jentezen Franklin, Furtick dares us to “ask God for the impossible”; I suppose we shouldn’t be surprised when we consider Steven Furtick was one of the speakers at Franklin’s recently concluded Forward 2010 Conference. As I’ve been showing you, doctrinal lines continue to be erased with great rapidity in The Ecumenical Church Of Deceit (ECoD). We have been fighting and will continue to fight battles which we thought were won or put to rest in the first three centuries of the Church’s history. What used to be commonplace in the world of the occult and in the world of hyper-liberalism is now common in the world of both Charismatic and Evangelical Christianity. Sound the Alarm…Your Divine Date with Destiny! Join Senior Pastor Paula White as she welcomes Bishop David Evans, Prophet Manasseh Jordan, and Kirk Franklin to Without Walls International Church for three nights, September 7 – 9, 2010 at 7:00 pm. Considering so-called “Bishop” David Evans will be there, “Divine Date with Destiny” is an interesting choice of words. You might remember my post Rick Warren Teaching The Law Of Attraction where I told you about America’s MegaPastor has written the foreword to a new book by “Life Coach” and pastrix Dr. LaVerne Adams, who also is known as the *cough* “Divine Destiny Doctor.” More evidence of this growing ECoD as it is rather curious in the first place that Southern Baptist—pretending to be Protestant—Purpose Driven Pope Rick Warren would help promote the work of a woman pastrix who’s in violation of God’s Word. Bishop David G. Evans, one of today’s most prophetic and provocative pastors, is preparing to celebrate his 18th year as pastor. Evans, pastor of the 27,000-member Bethany Baptist Church in Lindenwold, New Jersey, is setting the standard in ministry. With a weekly broadcast, The Power of Revelation, airing on BET, TBN and Streaming Faith, he’s one of the best-selling authors in Christendom… Bishop T.D. Jakes, pastor of Dallas’ The Potters House, will be joining Bishop David G. Evans as the preacher for the 7PM service. Benny Hinn’s friendship with E. Bernard Jordan dates back prior to Manasseh Jordan’s birth in 1990… E. Bernard Jordan, who answers to “His Grace” and “Master Prophet,” claims that “He is not one just to give information, but he is also known to create miracles and circumvent events merely by the power of his speech!” (Ibid., http://www.bishopjordan.com/who_we_are/about_jordan.htm ). The video [contained in her post] ends with a sober warning – “Coming to a city near you.” He’s not kidding. His star is on the rise, and the church is ready for such a false prophet as him. I wondered what Benny Hinn would come up with when his star started to fade around the time of the Lakeland un-Revival. Now I know. I’m just wondering how long it will take the monster he’s creating to eclipse him. PAULA WHITE: IS SHE, OR ISN’T SHE?